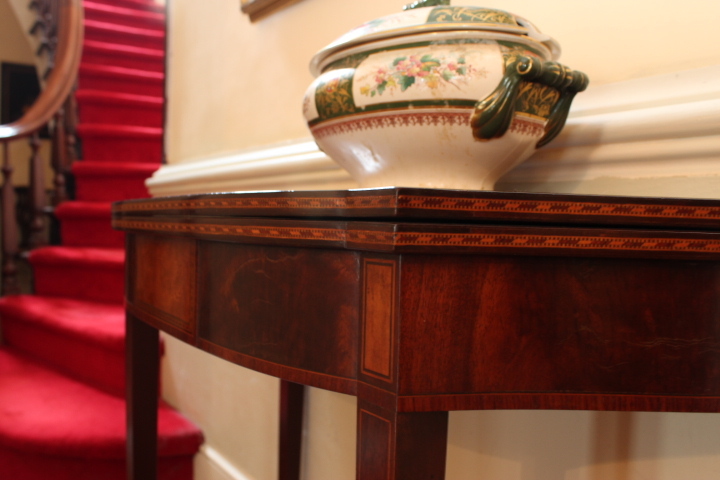 For the entrance hall, I chose the 19th century mahogany games table pictured above. I use the table to display framed photographs of some of my ancestors. Hopefully my ancestors are pleased with this arrangement. Here’s a close-up of the table’s carved pedestal. 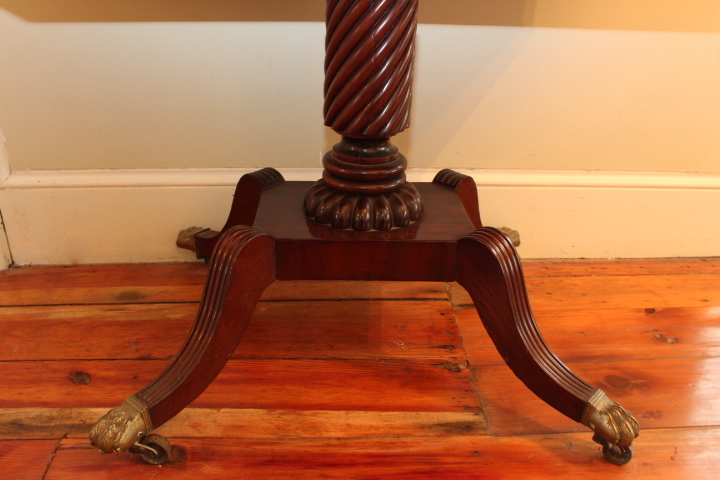 And another detail of the curved legs, which are capped with brass claw-feet. I have no doubt that during the Victorian era, some grossly-underpaid scullery maid was responsible for cleaning the detailed carvings on this table. A scullery maid still cleans the table today. A scullery maid named Kevin. 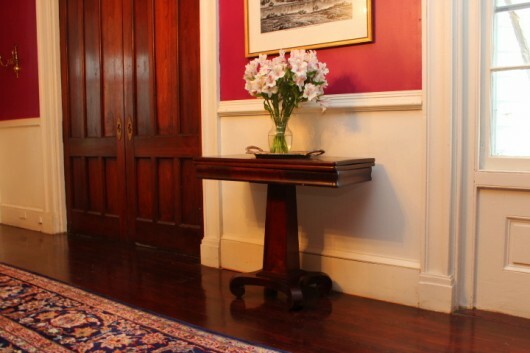 Another mahogany games table stands near the staircase. This one is Federal-style. Although the table is a reproduction, it is not without a colorful past. For it once belonged to the late, great Dominick Dunne. 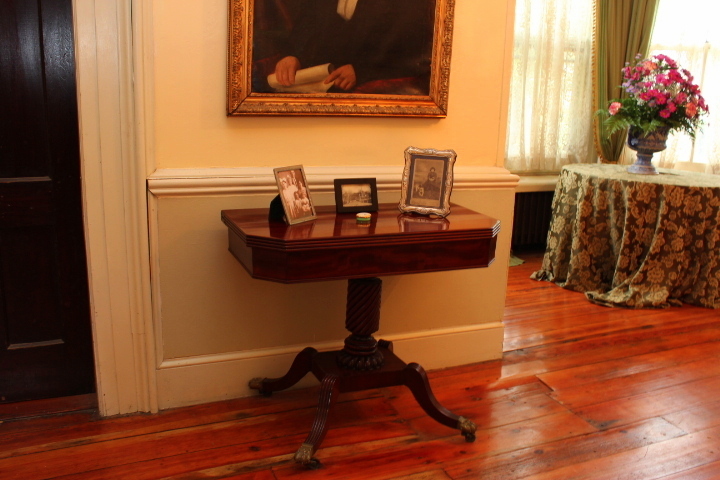 The Dominick Dunne table is one of a pair. Its twin is in the dining room, groaning under the weight of a big blue and white ginger jar. I’m kidding about the groaning part. I’ve never seen the table do anything but smile. You know what makes me groan? The radiator beneath the window on the right. 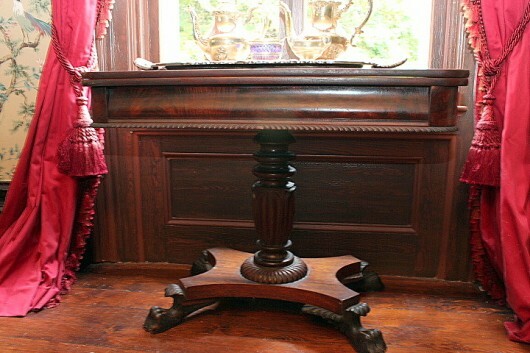 It is covering up some lovely woodwork. 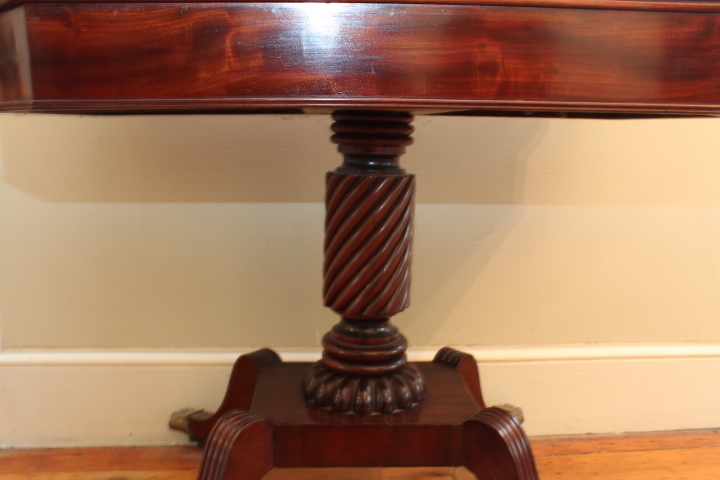 Also in the dining room is a Federal Empire games table. It was built some time between 1825 and 1835. A games table is a shape-shifter. For decorative effect, its hinged top can be lifted. 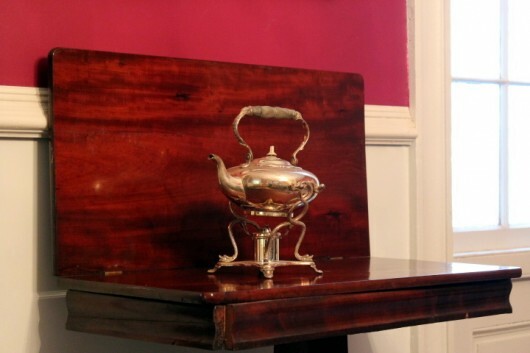 I sometimes display my English spirit kettle against the lifted top of the Empire table. 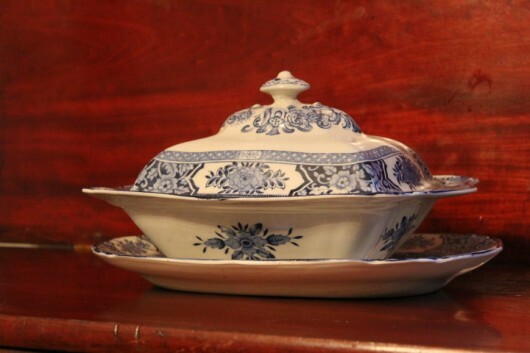 This blue and white Enoch Woods vegetable dish looks at home there, too. We’ll come back to the dining room and the Empire table in a moment. 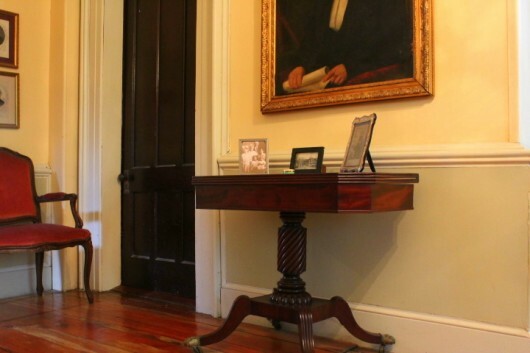 For now, let’s open the pocket doors and head into the music room. 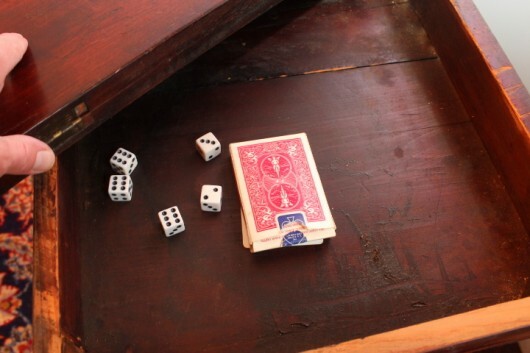 If you swivel the top of a games table, you will find its “secret” storage compartment. The compartment is ideal for stashing away cards, dice, and other game-y items. The compartment is also useful for hiding things. The scullery maid probably hid her flask of gin there. All games tables are small in scale, which means they can be moved from room to room as needed. If you’ll wait a moment, I’ll carry the Empire table to the parlor. I’ll even light a fire there, so we can be comfortable. Here’s the same Empire table, shape-shifted. Just pivot the top, open the hinged lid, and voila! 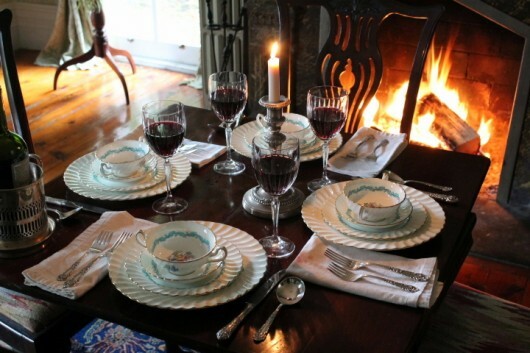 you’ve got elegant dining for four people. Now, are you thinking what I’m thinking? A games table could be indispensable in a small house or apartment, because it permits a “dining room” to be made on the spur of the moment. And that dining room could be located anywhere — even the master bedroom. 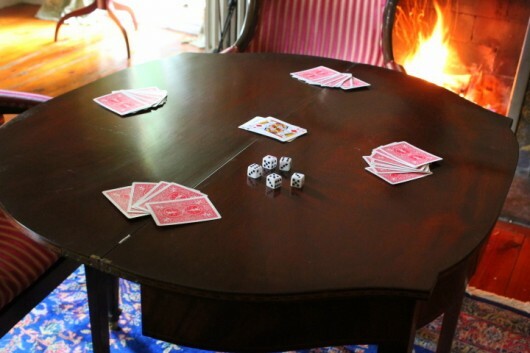 Since the parlor fire is lit, I might as well show you the Dominick Dunne table fully engaged. Talk among yourselves while I fetch the thing. Here’s it is, all set up for a game of cards. It took me all of ten seconds to move the table and open it up. It took me far longer to arrange the cards. If you’d like to see some of the other period furnishings I’ve acquired for this house, I’d be happy to show them to you. Just drop me a line in the comments field below. I’d love to see some of your other furnishingss! Kevin, thank you for another wonderful tour of your beautiful home. I always look forward to your tours–keep them coming! Your tables are gorgeous! Thanks for sharing and yes I’d love to see more! Diane, Louise & Martha – Thanks for taking a look. More to come! Gorgeous! We collect as well, though we don’t have as much room, but that doesn’t stop us (I need a bigger house, LOL). Do you go to auctions? We go to at least one a week. Also flea markets, estate sales, etc. We don’t always buy things, but I’ve seen a lot of gorgeous furniture sell for a small fraction of what you pay in stores for old or new. I don’t think I’d have use of a furniture store ever again… 🙂 I saw a game table much like yours sell this summer — very cool. I enjoyed seeing your tables and wish I had one! I really like the way you “talk” us through the tour also lol. Hi Sam – You are right. Auctions are a terrific way to shop. All of my games tables were purchased at auction. 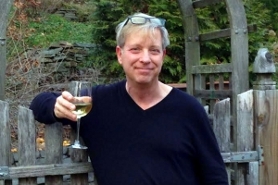 Terry – So glad you liked this little tour. I enjoyed your company! Please never stop being so amazing. I feel like I’m getting a degree in “Kevin Life Enhancement.” Priceless. Wow. Those are gorgeous. Yes, show us more of your antiques. The card tables are gorgeous! I bought on in the 70’s and foolishly allowed my husband to refinish it. I still love it and use it….but……I think the original finish would have been better. I would love to see more of your home. Kevin, thanks for sharing your treasures!! I started one of the first “Antique Malls” in Ohio in the early 80’s but had to sell out and move when my husband got transferred to Vermont! I have always missed it so much!! You’re giving me the bug!! But it’s o.k! JRBH – Glad you like my little collection, and took the time to tell me so. These old tables were finished with shellac, which produces a sheen that modern varnishes cannot replicate. I love your site with all your great ideas, your very useful (and often unique) hints. Two questions please, what do your use to keep these gorgeous antiques so beautifuly cleaned and polished? I use over-the-counter spray wax and am becoming disenchanted with the results. And second, if a piece of furniture ,antique or not, has been finished with varnish, what would be involved to refinish it with shellac? 4 teak chairs fold ,fit inside .Lv,following you on your site. 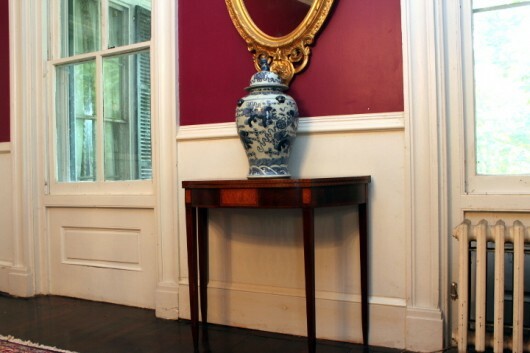 Kevin,just aquired a large mahogny double drop leaf about 1890, half stripped of layers of paint. Where do I go from there? ?suggest a stain please and ???shellac?? Hi Gretchen – In general, I dust my antique furniture with a microfiber cloth. When finger prints or smudges are evident, I go over the furniture with a soft cotton cloth and a tiny amount of lemon oil. As for replacing varnish with shellac…it can be done. I’d consult with a furniture-restoration specialist for the how-to. I have an old federal 1790 -1810 game table that’s been painted inside a compartment under the leafs. How can I safely remove the paint. 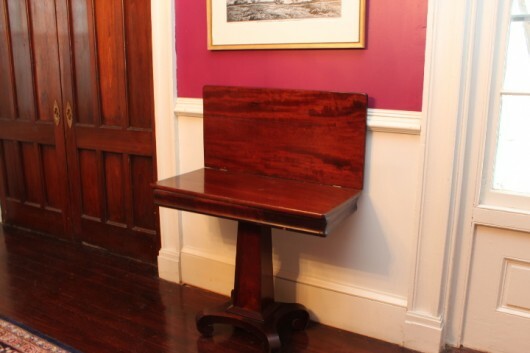 Terri-lee – Any chance you can send me a photograph of your table? You can send it via my Facebook page. Patricia Z. Massie – I’d love to advise you on how to remove the paint. However, without actually seeing your antique table in person, I’m afraid I might steer you in the wrong direction. Best to show the piece to a carpenter or a furniture specialist in your area. If you wish, send me a photo of the table via my Facebook page (linked in the comment above). 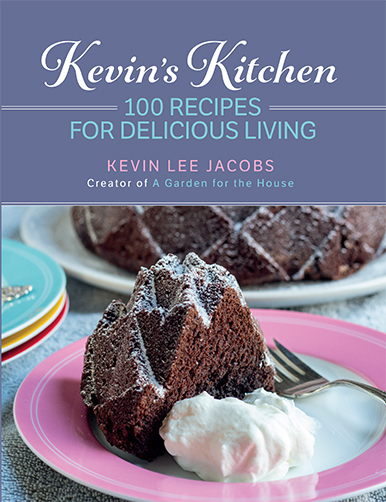 Kevin I am so happy that I stumbled upon your site. Your tables are beautiful! I have an antique game / card table that I truly saved from the trash. I was very lucky because it happened to all be there. You see, mine is a bit different than yours and any others I can find. It has four pull out drawers and four pull outs above the drawers that hold what look like ashtrays. I would love to send you pics if you would allow me to, would appreciate your expertise. I thank you for your time and your beautiful website.